This past week we discussed some of the basic housekeeping duties some nannies might do around the home such as, washing a baby’s laundry, getting the kids to help do laundry, making beds, and ironing. While some in-home child care providers strictly won’t do certain The Professional Housekeeper explains that being a professional housekeeper can be very rewarding. In Marta Perrone’s book The Professional Housekeeper she shows us how to be a great housekeeper. Marta Perrone also offers a Professional Housekeeper Certification. Household workers can take the certification exam that comes with the career and training guides to receive a course completion certification. – How to put together the necessary resume and qualifications. – How to interview properly to better your chances of being hired. – How to negotiate a job offer before accepting the position as it relates to: benefits, labor laws, salary and payroll, and more. – How to maintain your job by staying professional at all times. – How to handle problems on the job to avoid unnecessary terminations. For those willing to pitch-in and help clean the home they work in, they will have a better understanding of how to have an efficient, stress-free, clean, and organized environment. Anyone completing this training will be empowered and proud to illustrate all skills and professionalism with confidence. Stop by next Saturday for another Weekly Trip to the Library. 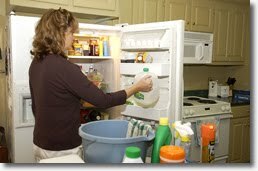 « Nannies and Au Pairs: Are You Responsible for Cleaning Out the Fridge? In our economy, there is a tendency for parents to get the most bang for your buck, and when the choice is between payceck and unemployment some nannies will step up more.Fortunately I grew up with a mother who did teach her kids domestic skills, we had chores, and yet still took home ec type classes and 4-H to further hone some of these skills. As a theater major in college, with a costume design emphasis too, I learned about fabrics, laundry, ironing etc. While I find ironing boring, I still now how to do it.And, because I worked in restaurants cleaning out refridgerators isn't a big deal. We had to date things too, etc.Household abilities can be a bargaining chip though too if a nanny has them.I was willing to work for people who wanted to use cloth diapers and some people say "gross, ick, etc." Well, it was one of the better paying jobs I ever had, with nice perks, etc. I would gladly go through using cloth diapers as there were many more positives to the position. Actually Lisa for me and many nannies I know I think it's typically been as the kids grow up and start going to school full time that's when the nanny's job description often changes and the nanny may take on more housekeeping responsibilities.If a nanny wants to keep the job as the needs of the family change many families may offer to add housekeeping to the nanny's duties to keep her employed. If the nanny is willing to do that she can be with the family for a long time. If not she might have to find a new job once the family needs less childcare. Also, first time, unexperienced nannies often take on both childcare and housekeeping without realizing how demanding that is and they burn out after the year never to work as a nanny again. I think we would all agree that all nannies do a lot of housekeeping just caring for kids in the kitchen, their bedrooms, and playrooms, and after baths. So a lot of housekeeping is always involved. But, the full houskeeping of a home should be the responsiblity of a housekeeper who is paid and has the time to do those tasks. When little kids are in your care it's almost impossible to maintain the entire home yourself. couldn't have said it better Fiona! Housekeeper is a professional domestic, who takes care of household tasks from cleaning and laundry to running errands and cooking. Some people are affluent enough to afford full-time housekeepers, but many in the middle class prefer to have someone who works for them part-time.Thanks.